Thirteen years ago, Moab Is My Washpot, Stephen Fry’s autobiography of his early years, was published to rave reviews and was a huge best seller. In the years since, Stephen Fry has moved into a completely new stratosphere, both as a public figure, and a private man. Now he is not just a multi-award-winning comedian and actor, but also an author, director, and presenter. In January 2010 he was awarded the Special Recognition Award at the National Television Awards. Much loved by the public and his peers, Stephen Fry is one of the most influential cultural forces in the country. This dazzling memoir promises to be a courageously frank, honest and poignant read. It will detail some of the most turbulent and least-well-known years of his life, with writing that will excite you, make you laugh uproariously, move you, inform you, and, above all, surprise you. This very wordy account covers Stephen Fry's days from Cambridge where he was involved in drama groups and on through his experiences in Stage, Radio and Television. There are many names and productions referred to that you will remember if you were around in those days. A good book for anyone wanting to know more about Stephen Fry's career. I must say I was very disappointed in this book. 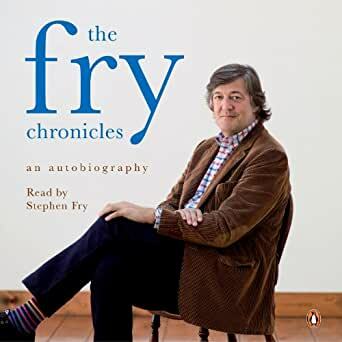 I usually admire Stephen Fry's talent enormously but his, Fry's Chronicles, I found incredibly indulgent, rambling, overwritten twaddle of little real interest except to his inflated ego. His blatant self deprecating style was annoying in the extreme and would be much more understandable in a younger, less mature person than his age warrants. This book poses the question; if he wasn't a 'celebrity' would it ever have been published? Not bad. A number of pages that had to be flicked through due to mind numbing bordom but also lots of laugh out loud bits which made people wonder / ask what I was reading. Some interesting anecdotes but had to give up half way through... too self-indulgent. Fabulous. Made even better as it was read by himself. There is no better book to read than one written by someone is in love with the English language. It is not love for the sake of self-indulgence, or intellectual superiority but it is a love that Fry is compelled to share his anecdotes with others.